A gopher frog tadpole metamorphosing into a juvenile frog. Photo by Florida Fish and Wildlife Commission, courtesy of Flickr. If ephemeral wetlands dry out before the tadpoles develop lungs and become froglets or toadlets, an entire cohort dies. Despite the risks, ephemeral wetlands are also sanctuaries where hungry fish cannot encroach. Fish – and some aquatic insects – devour eggs and tadpoles. Eggs laid in fish-free waters have a much better chance of hatching into tadpoles and reaching metamorphosis. Greenberg and her colleagues studied 6 frog and toad species that represented 4 reproductive strategies. “We wanted to see how rainfall, temperature, and other environmental factors affect reproductive success,” says Greenberg. The scientists published their findings in the journal Ecosphere. Reproductive success is influenced by the hydroregime – the season, frequency, depth, and amount of time that water remains in wetlands. The changes will not affect all species equally. Frogs and toads have various reproductive strategies. The species breed in different seasons, and their tadpoles vary in rates of development and the timing of metamorphosis. 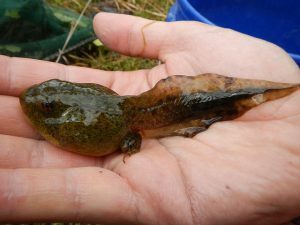 For example, eastern spadefoot toad tadpoles metamorphose into juveniles in as little as 2 weeks, while southern leopard frog and gopher frog tadpoles need several months or more. Transformation from tadpole to young frogs or toads is juvenile recruitment, and is a way to measure reproductive success. Greenberg and her colleagues used long-term data from 8 ephemeral wetlands in the Ocala National Forest, Florida. The scientists have continuously tracked all of the amphibians and reptiles entering and exiting these wetlands for 22 years. The results suggested that air temperature has minor effects – or no effect – on tadpoles of most species. For 5 of the 6 species studied, reproductive success was highest when wetlands stayed inundated for the maximum amount of time tadpoles need to mature. The total amount of precipitation, plus at least one hydroregime variable, were also important factors for the 5 species, which include the southern toad, oak toad, eastern narrow-mouthed toad, southern leopard frog, and the gopher frog, a species of conservation concern. The gopher frog and the southern leopard frog have long breeding periods, and slow larval growth. Their tadpoles also stay in wetlands until late spring, regardless of when the eggs were laid. “Having water continuously in the wetlands through spring metamorphosis is an important predictor of success for these frogs,” says Greenberg. Rainy years were best for most species, but not the eastern spadefoot toad. 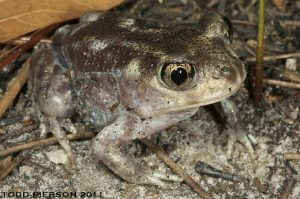 Spadefoot toads breed explosively after heavy rains, such as those associated with tropical storms. The intense storms rapidly fill previously dry wetlands. However, heavy rains after breeding seemed to make it harder for the tadpoles to survive. The eastern spadefoot toad spends most of its life underground, burrowing through the sand. Photo by Todd Pierson, courtesy of Flickr. Reproductive success for eastern spadefoot toads was closely associated with the number of adult toads breeding. Tadpole survival was also affected by unseen, seemingly random factors. For example, aquatic insects prey on eggs and tadpoles. Tadpoles are also competing with each other for food. “These factors can affect survival rates, but are very difficult to measure in the field,” says Greenberg. Maintaining multiple ephemeral wetlands that fill and dry at different times increases the odds of successful juvenile recruitment by diverse amphibian species with differing hydroregime requirements. The study shows how environmental factors interact with reproductive strategies to influence tadpole survival to metamorphosis. Frogs and toads with shared reproductive strategies were influenced by similar factors. For more information, email Katie Greenberg at kgreenberg@fs.fed.us.